Alongside the new Tolo car and Pony Club we have also added two new switch adapted plush toys to our catalogue. Both are available on the Special-Needs-Toys website and from our distribution partners in UK and Europe. Thomas Old McDonald Bear sings “Old McDonald had a farm” and makes animal noises. Encourage your child to copy them. Peek-a-Boo Dolly engages your child in a game of peek-a-boo. Both of these new switch adapted plush toys can be activated by pressing a standard 3.5mm switch connected to the toy or by using the in-built switch. This autumn we have added two new switch adapted cars to our catalogue. The first is the Tolo First Friends Pony Club and the other is the Tolo First Friends Car. – movement as the cars drive along for about 1 metre. Both cars are great but I guess some will like the added play elements of the pony and trailer. Which would your child like most? Get in touch. In 2011 I blogged about a young lady called Natasha; her father asked us to adapt a radio transmitter with Sipp and Puff switches to enable Natasha to get into switch accessible sailing of a model yacht and to encourage her to develop her sailing skills. It was a big success! 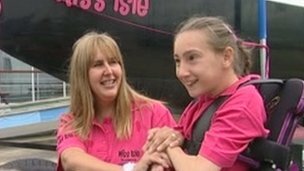 Natasha, who started her switch accessible sailing when she was 12, has so far raised £8,224 for Isle of Wight Scope, Cowes RNLI Life Boat and the Ellen MacArthur Trust. She said her next challenge would be the Atlantic, which she described as “my ultimate dream”.